When I went to Russia last month I only had one Vera Bradley sighting, but it was a good one! This woman was carrying two pieces of Vera Bradley. We were on a walking tour in St. Petersburg and she was on the same corner as us about to cross the street in the other direction that we were headed. The corner was packed with people, so if she hadn't been carrying the umbrella I probably wouldn't have noticed her. 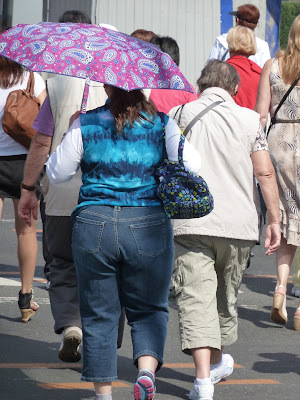 I can't even tell which bag she carrying, but it is in Indigo Pop and you can see her Boysenberry Umbrella. It was definitely fun to see another Vera Bradley fan while we were there!